If anyone asks me for a pithy comment on the 2017 season I would say that it has been a hit-and-miss affair. Those who have been lucky enough to catch a good hatch of fly outside the Mayfly period have had some really memorable moments – and these have persisted right up until the end of the season. One guest, who paid the equivalent of a year’s subscription (at the lower end of our subscription range) to obtain a day on our water via our donation to the Wild Trout Trust annual auction, had just such a day on the 2nd October. Fishing Reaches 9 and 10 he caught 20 brown trout – 4 takeable and 16 which he described as under-sized – and 12 grayling. Most of these, he told me, were caught on dry fly: “a black Adams” (not sure I would recognise that!) and “a light brown Klinkhammer”. He also fished a nymph on Reach 9, which he found more difficult but had success with grayling on the usual Gold-ribbed Hare’s Ear and the good old PTN. I was extremely pleased to hear that, not only because he had obviously enjoyed his day immensely, but also because it again vindicates my view that the last few weeks of the season can provide such great sport. The river is very under-fished in September and October – it is unusual to meet another rod – and in a low water year such as this, it is an entirely different and more challenging place than it is in May and June. This year the cress growth has been prolific (good news for the health of the river), producing countless small lies and runs, any of which can hold a takeable fish, which then requires very skilful handling to avoid being weeded, and most of which are very “street-wise” indeed by this time of the season. As we have often said, in these conditions quiet and cautious wading gives a huge advantage in approaching a feeding fish, as proved by our guest on 2nd October, whereas in the early part of the year when the river is running bank high it is not so important. When compared to previous seasons it can be argued that those returns are inflated by the ease of web site recording (as opposed to the old paper return system). However I think that this trial year, which relaxed the rules on nymphing and wading, is also an important factor and must be welcomed. Of those returns I think you will all agree that the wild trout figure is the most encouraging. That really does demonstrate that all the restoration effort and expense that has been applied to the Upper Avon over the past 6 years, and from which we have benefited more than many other fisheries, is paying real dividends. Whether or not you believe in Brexit, the EU Water Framework Directive and the funding it has generated via DEFRA has had a magical effect on the river. Corfe End Lakes will always be a problem in a low water year because of insufficient ground water and lack of through-flow. This year those problems were at their worst, and were compounded by increased silting which shallows the lakes, raises water temperatures and generates algal growth, ultimately de-oxygenating the water. Hopefully we will see an improvement next season, as the Lakes do give a lot of fun early in the year particularly if weather and water conditions make the river difficult. As for grayling, those figures are for fish caught within the trout season, but you are all welcome to continue to fish for grayling throughout the winter, as the rules make clear. Please do put in your returns for these, and of course if anyone wants to have a go for pike they are equally welcome to do so. All I would ask regarding pike is that you do give me a ring before you go, to let me know where and when you will be fishing. Because of the work we have been doing to otter-proof the stock ponds this month I have not been able to electro-fish for pike during the very restricted window when the EA permits this, so there will be quite a few about. I know our Secretary has already informed you that the autumn committee meeting will be held on 23 November so if you have any comments, or suggestions for improvements, please do let him have these in good time. I would also like to thank all those who gave up a morning to help with our work parties – it certainly makes my life a lot easier! 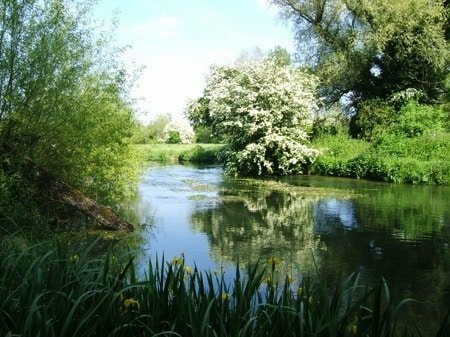 I will attach a last photo to end with to fire you with enthusiasm for next season – this is the river at its very best last spring at the beginning of the Mayfly hatch on Reach 9.